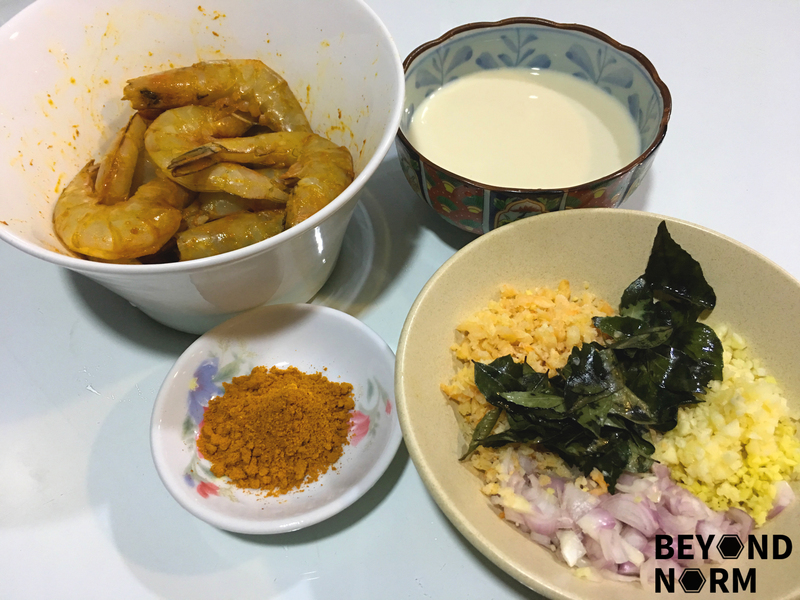 Don’t be deceived by its name, this Indonesian Prawn Curry 印尼咖喱虾 does not refer to the origin of the seafood but rather the taste. This is a very popular dish in Malaysia and during our recent visit to Ipoh, Perak, I got to try this dish for the first time. It tasted amazing and what I liked about this curry is I believed the restaurant used soya bean milk instead of coconut milk. In my opinion, this is a much healthier dish. As I am always on a lookout for new dishes to share with our readers, this was definitely one of the dishes that I could not wait to recreate in my kitchen. 600g prawns, with shells on and legs trimmed. 3 stalks of curry leaves, leaves stripped from stalks. 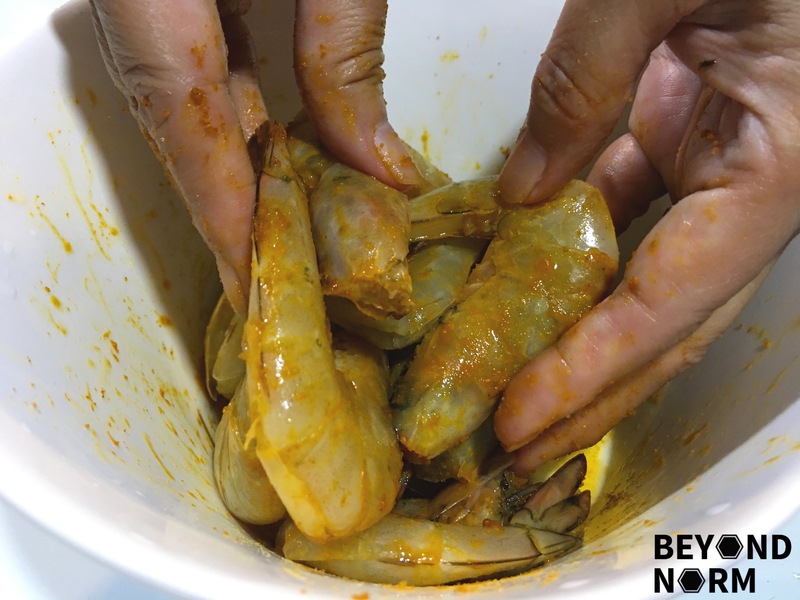 Marinate the prepared prawns with 2 tablespoons of curry powder and ½ tablespoon of salt. Heat wok or claypot with 3 tablespoons of oil. Add in shallots, garlic, ginger and lemongrass. Fry till fragrant. Next, add in the dried prawns and belacan and fry for a minute. Add in 1 tablespoon of curry powder and half the curry leaves. Then fry for another 2 minutes. Add in the prawns and give it a few quick stirs. Add in ½ cup of chicken stock and turn the heat up. Bring it to a fast boil and simmer for 5 minutes. Add 2 cups of the soya bean milk and turn up the heat to bring to a fast boil. Then lower the heat and let it simmer for 5 minutes. Half way through the cooking process, you may add more soya bean milk if necessary. 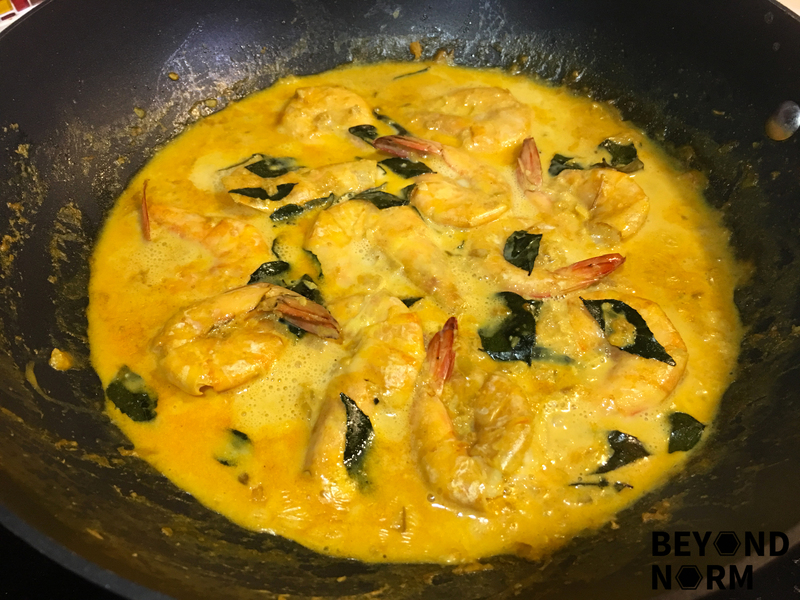 Once the prawns are cooked through, add in the rest of the curry leaves and give it a quick stir. is the soybean milk sweeten ones?